Holiday villa Tenerife property renovation review. A holiday villa Tenerife alteration and renovation without resulting in tears. A holiday villa Tenerife needn't necessarily be built from scratch. I once met a couple who had purchased an old, come down farmstead consisting of 3 buildings which is often found on fincas (rural property or farmsteads ) on the biggest Canary Island. After a few years of building alterations they could call the country house their beautiful 'holiday villa'. How did they cope with building restrictions for houses in Tenerife? They built a high wall facing the street where nobody could object that the look of their holiday home would show up as a violation of keeping with the historic village image. Walls cannot just be built for that purpose in a town but, may be possible in rural areas. Anyway, the German couple tackled alterations of their dream of a holiday villa Tenerife almost by the book. They "renovated" three small buildings by joining them with a mixture of very modern and olden days' flair. The antique look is so typical for North Tenerife architecture. Modern glass sliding doors were placed to face a garden in the back. 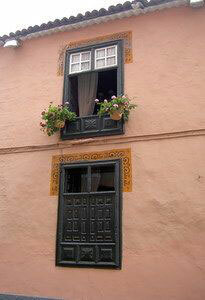 They were preserving the style of all other sides of the buildings by Canary Island traditional standards. They found discarded, old fashioned wooden window frames and doors in good conditions. Local people helped with that task and could also be trusted for their installation. Had the villa not been out in the country it would have cost them double for making building alterations and repairs. Please, mind when thinking of investing in Tenerife that renovations are sometimes more expensive than new constructions. Custom woodwork is regarded as part of Tenerife heritage and must be preserved by law. The German couple was lucky to find elderly artisans with traditional construction and carpentry skills which were happy to comply. I remember a couple of wooden small bay sash windows where their local carpenter enclosed a boxlike wooden bench with matching timber. Such a wooden window bench is depicted above. However this particular one was matched with other dark timber of the interior. 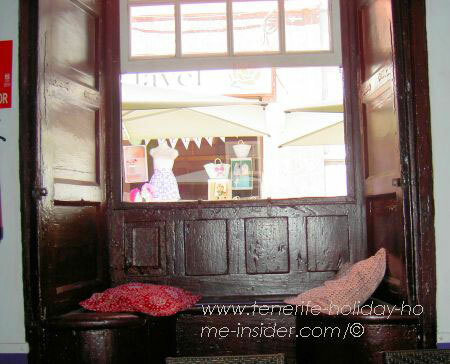 Built-in seating places like that are very common in antique Tenerife houses. The end result by renovating the villa is indeed remarkable. No town Mayor will object to little sins of 'reformas', (building alteration )when word of such loving care and respect for traditional details gets around in the village. The two Germans have set an example of goodwill and great taste to apply to Tenerife rules and regulations with their renovations. The traditional joints with modern sculptures inside and out in this holiday heaven by Icod de los Vinos. Colorful abstract paintings and local handy craft contrast with the simplicity of the colonial country style. This shows what can be done with houses in Tenerife. So far, the German owners have been very happy with their rural villa as their holiday home in Tenerife. Sorry for not disclosing its address for safety reason. Number 1 is a beautifully renovated apartment in a Realejos holiday resort. Number 2 is a lovely renovated apartment in Los Gigantes Puerto Santiago. Review of Orotava retirement property with woodworm. A potato finca with many renovating problems . Review of stunningly renovated Villa Museum Abaco.